This 4 bedroom villa is situated in a large secluded garden . 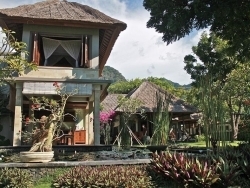 You will have magnificent views with the Bali sea in front and nine mountains as dramatic backdrop. Our friendly staff will take care of all your needs. This 3 bedroom villa is situated in a large secluded garden . 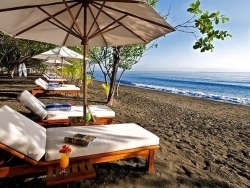 You will have magnificent views with the Bali sea in front and nine mountains as dramatic backdrop. Our friendly staff will take care of all your needs. This 2 bedroom villa is situated in a large secluded garden . 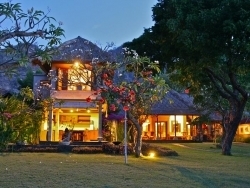 You will have magnificent views with the Bali sea in front and nine mountains as dramatic backdrop. Our friendly staff will take care of all your needs. This 1 bedroom villa is situated in a large secluded garden . You will have magnificent views with the Bali sea in front and nine mountains as dramatic backdrop. Our friendly staff will take care of all your needs. This 1 bungalow bedroom is part of a beautiful luxurious resort of 32 private rooms. It is approximatively 50 square meters and it is located around the pool and surrounded by our tropical garden and close to the beach. This 1 bedroom bungalow is part of a beautiful luxurious resort of 32 private rooms. It is approximatively 50 square meters and it is located around the pool and surrounded by our tropical garden.